Herat – A group of 13 young Afghan women and men from different backgrounds and ethnicities have spent a week together in the western Afghan city of Herat to exchange experiences, direct and produce a film about migration. The initiative is part of IOM’s Global Migration Film Festival Participatory Video Project to engage migrants and host communities in participatory filmmaking that strengthens social cohesion. Participants learn how to use a camera, frame images, tell a story using a microphone and make editorial decisions through consensus. “In Afghanistan, women often don’t have a voice and we are here also to represent these voices,” said Shokya, who with her friend Masoma, was one of five women in the group. Recently returned from Iran, both were handling a video camera and working with male colleagues for the first time. Millions of Afghans have experienced migration, both forced and voluntary, in the past four decades. In 2017 alone, 460,000 undocumented Afghans returned or were deported from Iran, 100,000 from Pakistan and 7,000 from various European countries. In 2018, due to various push and pull factors including a deteriorating economic situation in Iran, tightening border controls in Turkey and an ongoing drought in Afghanistan, over 500,000 undocumented people returned between January–July. But with an increasingly fragile Iranian economy, Afghans are returning home in large numbers. Without remittance payments from abroad, and no jobs at home, many families have no option but to migrate to urban centers like Herat. Over 52,000 people have moved to the city since the beginning of the drought and live in camp like situations in 179 sites throughout the city. 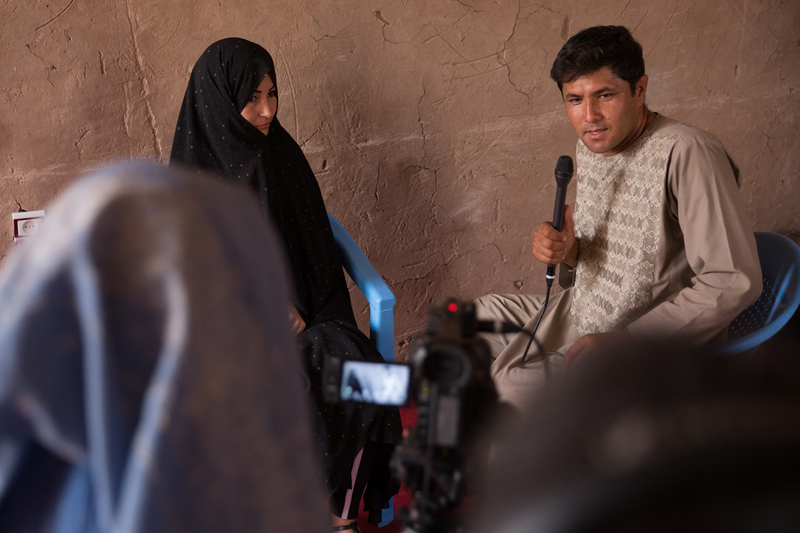 “This participatory video project generates dialogue between groups affected by migration in different ways – internally displaced people (IDPs), returnees or part of the Herati host community,” said IOM Afghanistan Public Information Officer Eva Schwoerer. The video was partly filmed in a desolate IDP camp on the outskirts of the city, which is home to more over 50,000 people driven from their homes by drought and conflict. Other sections were filmed in the gardens of the Manzar-e Jahad museum, which offers a panoramic view of the city, and in a community, where facilitators led a participatory video editing session followed by a community screening. At the end of the year, at the 3rd Global Migration Film Festival, an international version of the video “Welcome to Our Life” will be screened around the world. You can watch “Behind the Scenes” here. IOM’s GMFF Participatory Video Project, funded by the IOM Development Fund and supported by NORCAP, was launched in Amman, Jordan, in October 2017. In November it travelled to Malakal, South Sudan, and in December to Geneva, Switzerland. In 2018 moved to a shelter for Venezuelan migrants in the North of Brazil and in July focused on a group of Malagasy women victims of human trafficking. Afghanistan was its final destination. For further information please contact Eva Schwoerer at IOM Afghanistan. Email: eschwoerer@iom.int, Tel. +93 729 229 129.